Henry James Sercombe was born in Newport, Isle of Wight in 1852 but very little is known of his early life. His father is unknown and Henry first makes an appearance in the records in the 1881 census. By this time his father was dead and Henry was living with his widowed mother Eliza (b1814) at Hunny Hill, Carisbrooke, Isle of Wight. Eliza, originally from Wandsworth, Surrey, was living on the "Rent of houses" while 29-year old Henry was an ironmonger's assistant. In the spring of 1886 Henry married Kate Jolliffe (b1858, Newport) at Newport. They were to have two daughters; Helen Lily (b1891) and Kate (b1894), both born at Newport. Between 1894 and 1901 Henry and Kate moved to Yeovil where Henry set up his own ironmonger's business at 73 Hendford, immediately opposite the Three Choughs Hotel. In the 1901 census Henry and his family were listed living above his shop premises. 49-year old Henry have his occupation as an ironmonger and employer. Henry was listed in the 1903 edition of Whitby's Yeovil Almanack Advertiser as a "Tinman, etc. of 73 Hendford". There were two entries in Collins Yeovil Directory of 1907; one as a tin worker and the other as "Gas Fitters, Plumbers, etc". It is most likely that the buckets, etc. shown hanging outside his shop in the Gallery below were made by Henry. In the 1911 census Henry, Kate and Helen were still living at 73 Hendford above the shop premises. Henry gave his occupation as "Ironmonger & Sheet Metal Worker" while 20-year old Helen was a "Clerk to Glove Manufacturers". Kelly's Directory of 1919 listed "Henry J Sercombe, Ironmonger, 73 Hendford". The 1935 edition of Kelly's Directory listed "HJ Sercombe & Co., Ironmongers of 73 Hendford" although it is assumed Henry had retired by this time as he would have been 83. I could find no further trace of Henry or Kate. 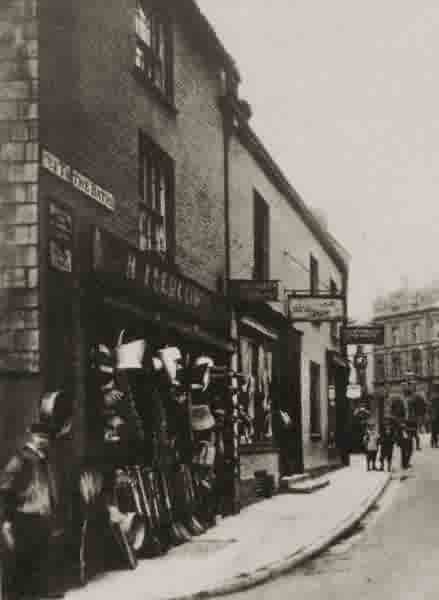 Henry Sercombe's hardware shop, in Hendford opposite the Three Choughs Hotel, photographed around 1905. 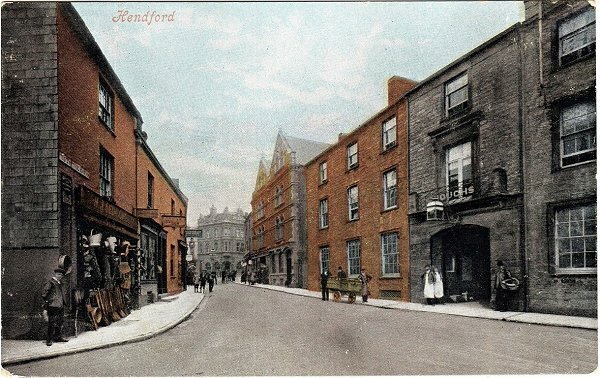 A hand-coloured postcard of the northern end of Hendford dating to about 1905. 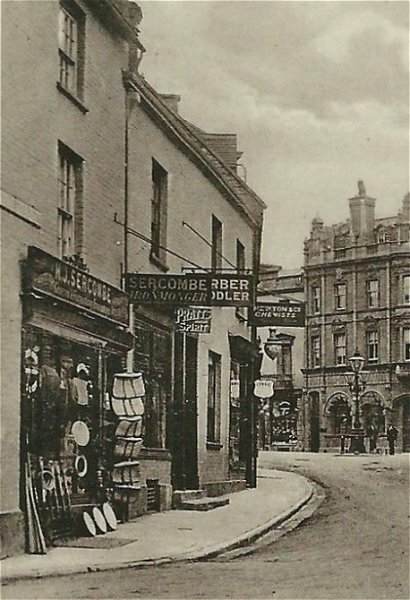 At right is the Three Choughs Hotel and at left is the ironmonger's shop of Henry James Sercombe, listed as an ironmonger and 'tinman' in trade directories between 1903 and 1935. An enlargement of the same photograph as above. 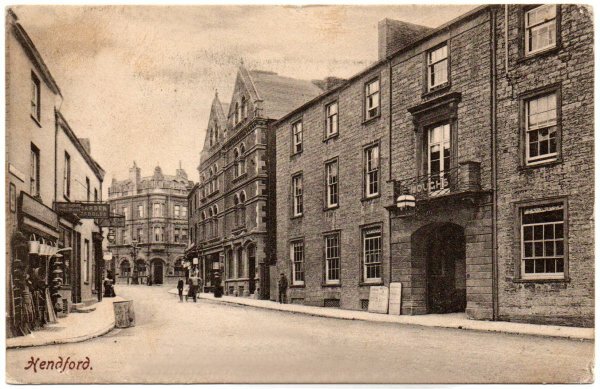 This postcard dates to 1909 and is a general view towards the High Street / Princes Street / Hendford junction, again with Henry's shop at far left. The buckets hanging outside the shop were most likely made by Henry. A photograph of Hendford dating to the mid-1950s. 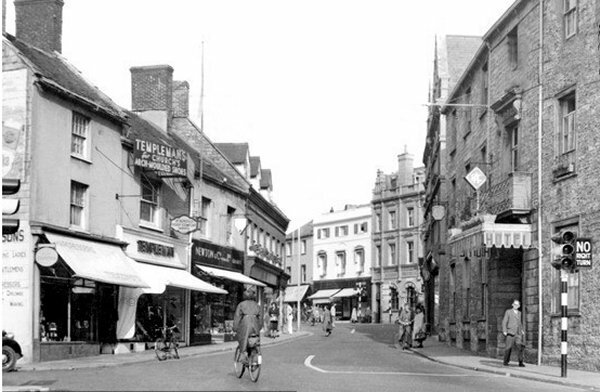 Henry's former shop is at extreme left. 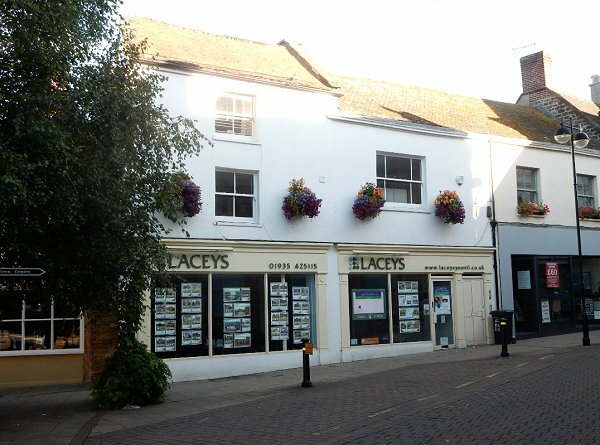 Today the former shop premises of Henry Sercombe is the three storey part of Laceys estate agents. Photographed in 2016.